The 50 metre Benetti motor yacht Lumiere is back on the market, now listed for sale by Frank Grzeszczak Senior and Junior at IYC. Delivered in 1999 and designed by Stefano Natucci, Lumiere is a spacious steel-hulled yacht that can sleep up to 14 guests in six cabins with 11 crew. She has since been refitted in 2015. On board, the carpeted saloon includes a lounge and TV, with electrically operated blinds for light control. There is a separate dining room, which boasts a glass topped table with seating for 12. An identical dining table is located on the aft deck for al fresco dining. The master suite, complete with an office, is located forward of the galley on the main deck and features panoramic windows and an en suite with Jacuzzi bath. Interiors are elegantly finished in oak and honey-coloured onyx and marble. There are numerous areas for relaxation and recreation on board Lumiere. The sun deck, designed with both an open-air media lounge and a covered living area, also includes a Jacuzzi and bar. The sky lounge and bridge deck both possess numerous seating areas, as well as a card table and additional pantry. In her foredeck Lumiere holds a pair of Novurania tenders and three Jet Skis. 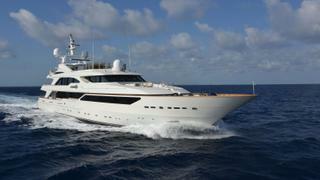 This yacht for sale is powered by twin 2,226hp MTU 12V396 TE94 engines. She has a cruising speed of 13 knots and can reach a top speed of 16 knots. Currently lying in Italy, Lumiere is asking $12,900,000.